You Can Find Some of LA's Best Food Exclusively on Instagram. Here's How. In a city full of food trucks, street carts, and secret supper clubs, you hardly have to step inside an actual restaurant to enjoy some of the best food in Los Angeles. And thanks to a growing number of entrepreneurial Angelenos who are using social media to sell their food -- often cooked in home kitchens and backyards -- we now have even more clandestine culinary options to explore. A cottage industry of people selling food out of their home has existed for time immemorial, and underground eateries have long been part of the fabric of LA. But thanks to the pervasiveness of social media and savvy marketing skills, these pioneers have taken their businesses to new heights and changed the way many of us eat. 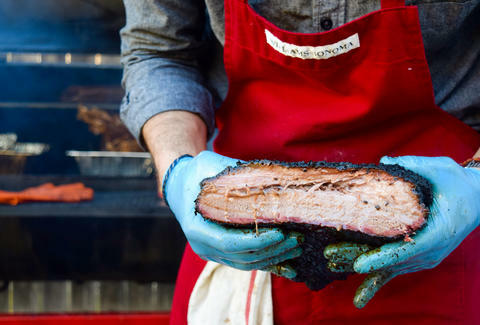 From a pair of former gang members selling takeout containers of comfort food out of their South LA apartment to a real estate agent offering Texas-style brisket from a giant smoker in his Studio City driveway, LA is now home to a wide range of underground food businesses. For some it’s an opportunity to grow a following and earn money to eventually open up a brick-and-mortar, while for others it’s merely a fun hobby and natural extension of cooking for friends and family with the chance to make some extra money on the side. But the common thread that ties many of them together is using Instagram and other social platforms to show their followers what they’re cooking on a particular day, offer instructions on how and where to get the food. 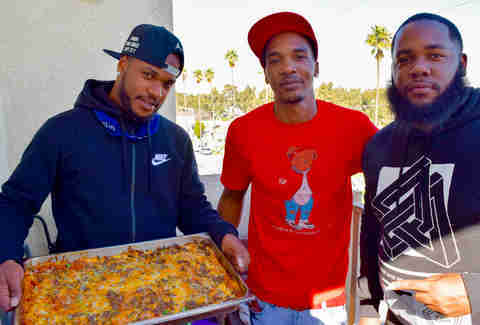 “We started just to stay out of trouble,” explains Roberto “News” Smith, the sous chef of Trap Kitchen, who started selling food out of an apartment kitchen in Compton with chef, and former rival gang member, Malachi “Spank” Jenkins in 2013. “We wanted to find something else besides hustling in the streets to make some money and we noticed that we had a gift with cooking.” Jenkins, a former member of the Crips, attended Le Cordon Bleu College of Culinary Arts in Las Vegas and had recently returned to LA after catering to high-end “nightlife” clientele in Vegas and later for entrepreneurs in Portland. “He had a big following on Instagram and he was already documenting the pictures of his food, and you'd see the comments, ‘Oh, that looks so good, can I try that?’ or ‘Do these guys do parties?’ So I noticed that and thought, ‘People want to buy this,” so we ran with it,” says Smith, a former member of the Pirus (Bloods), who was introduced to Jenkins through a mutual friend. "I already had a store on Instagram, selling clothes, jeans, watches, and other things, and it gave me the idea that people would shop for food there, too,” explains Smith. “People already love to shop online, so it's sort of the natural evolution of it. But I like selling food better because once a person has bought the merchandise, they don't come back until you have something new. So if you don't get anything new, you have to find some new customers. With food, they don't care -- they'll come back 20 times for the same thing." The popularity of Trap Kitchen quickly grew among friends and neighbors, as they continued posting on Instagram with customers stopping by the apartment to pick up their orders or via delivery thanks to their friend DJ Kev. Then suddenly, they had their first celebrity client. “Two months in, we caught the attention of somebody that works for Tyrese Gibson, and we got a call from PR team about catering,” says Jenkins. “And it just snowballed from there.” Since then, they’ve cooked and earned praise from the likes of future Coachella headliner Kendrick Lamar to John Legend and Lenny Kravitz at The Roots’ Grammy party, shot an episode of Martha Stewart and Snoop Dogg’s new show, discussed a show of their own with networks, and travelled around the country to cook. They’ve since moved their operations to the Harbour Gateway neighborhood of South LA and now have nearly 24,000 followers on Instagram. Not far away in Watts, Keith Garrett of All Flavor No Grease is another young food entrepreneur who parlayed his self-taught cooking and social media skills to find a better alternative to hustling on the street. “I didn't see a 401k in my future when I was a street pharmacist, so I became a street chef,” effuses a charismatic Garrett. He’s been cooking up his own take on tacos, quesadillas, and burritos from a driveway on 108th St for the past several years, and has since garnered over 82,000 followers thanks to his Instagram posts. His feed alternates between close-up shots of whatever he’s cooking up on the griddle that day, talks about God, and freestyle raps and songs inviting his followers to come eat -- pitches that rival the best TV salesman. Garrett’s now signature, flavor-packed quesadillas -- which also come to him in a dream just as the idea to start an Instagram page named All Flavor No Grease did -- feature a large flour tortilla stuffed with shredded cheese, the choice of chicken, steak, or shrimp (or all three, get all three), a homemade pico de gallo, and topped with a cilantro salsa and sour cream. The formidable comfort fare, which Garrett initially sold as a giant taco, now gets chopped into more manageable strips -- a trademark of All Flavor No Grease. 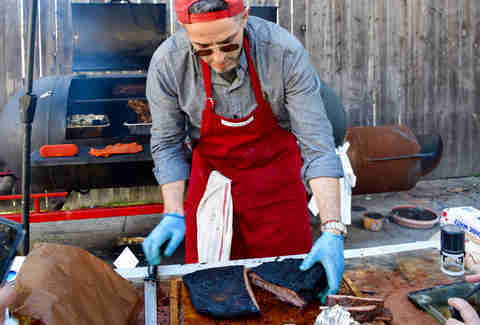 Bakman took numerous pilgrimages to the barbecue legends of Texas -- he’s preparing for his 10th trip -- where he ate, asked questions, read the wisdom of pitmasters to learn as much as he could about cooking brisket. “It's something that's very simple and basic,” he says. “Yet it's the hardest cut, it's intimidating. You have to pick the right meat, trim it right, cook it right and move it around.” Bakman shows us an intricate hand drawn chart indicating subtle variations in temperature throughout his smoker. 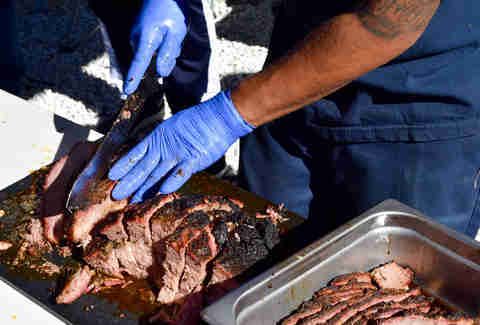 “She has slutty cousins, the burger and the steak, that take minutes to cook,” Bakman says of brisket. “This one you have to get into a relationship with, you have to be nice for 20 hours. It's a commitment.” If you watch Bakman’s Instagram story, you’ll notice that he gets up nearly every hour throughout the night to check on his brisket and ensuring the proper levels of smoke and temperature. 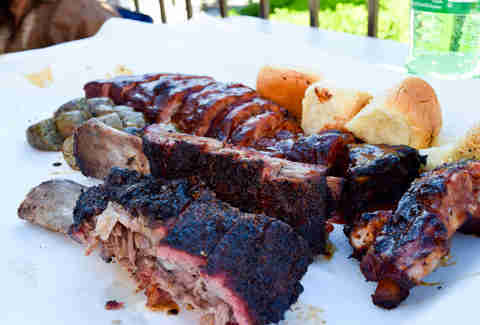 If you’re on the hunt for more great barbecue in LA that isn’t in a restaurant, then you’re also going to want to track down Ragtop Fern’s BBQ. On a quiet dead end street that borders Koreatown and Rampart Village, you’ll find Fernando Carrillo, aka Ragtop Fern, tending to his custom smoker “Lucifer” that he welded himself and burns mostly applewood to smoke everything from ribs to brisket to pork shoulder to chorizo made by local artisan The Chori-man. “At first it was just for fun,” Carrillo explains. “Being Mexican American, we grow up doing carne asada, which is basically a lot more hot and fast grill type things, but me being born here, I thought, well, the American thing is BBQ, so I started messing with it.” He started with a small weber kettle, graduated to a larger grill his girlfriend bought for him, and then furthered his obsession when he had a friend teach him to weld so he could build his own smoker. He now sets up shop in his front yard most weekends when he’s not taking one of his vintage Cadillac lowriders to a car show or meetup. 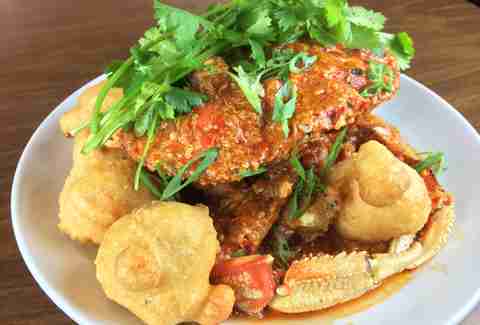 "Social media was huge for us, and it built our entire business,” explains Nguyen Tran of Starry Kitchen, the legendary underground restaurant that started nearly 10 years ago when social media was still in its infancy. 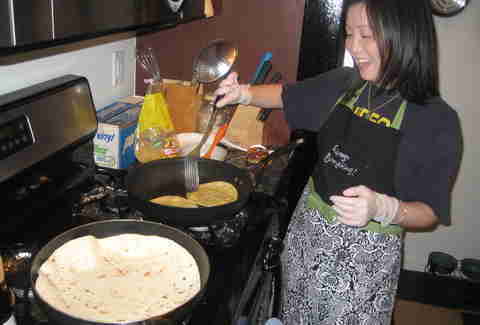 Not long after the fall of the economy in October 2008, Tran’s wife Thi began cooking Asian comfort fare influenced by what she grew up eating -- her parents were Chinese born and lived in Vietnam until the start of the war -- and posting photos of her meals to Facebook. 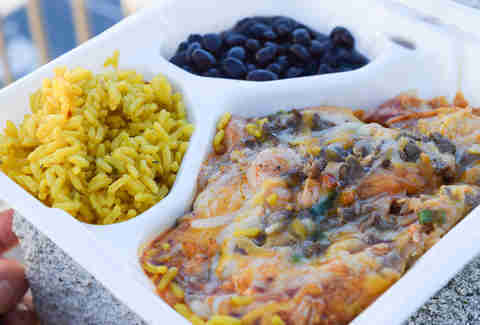 Then when she lost her job in advertising due to the economic collapse that following April and began looking for job suggestions from friends, and everyone insisted that she cook, especially after seeing the meteoric rise of Roy Choi’s Twitter-fueled food truck craze. But Thi was initially resistant. Nguyen goes on to say, “Getting caught is always going to be the risk of being illegal, but it's also part of the reason people come together for it. They're in cahoots with you and that's part of the appeal, at least for us. But that appeal can wear off quickly because they need to like it too." Carrillo, on the other hand, isn’t interested in expanding his front yard operation to a brick-and-mortar -- despite serious offers -- instead preferring to focus on cooking for his neighborhood and car community at rallies and meetups. “I don't want it to consume my life because I think if I become too much a part of it, I would think it would be almost phony,” he says. “I've had people offer me partnerships where they would fund me to set me up or connect me with investors. But honestly, once you start hitting that really heavy, commercial service level, you start to cut corners to meet up with demand. And I'm really nitpicky and I get focused on what I do and I don't want anyone else doing it differently. I want to do everything, but I can't do everything if I go to that level. And then the quality of it wouldn't be there anymore.” Nonetheless he’s taking steps to ensure his operation is in compliance with permits, licenses, and is in the process of getting a commercial kitchen. With a new proposal to decriminalize street vending in LA finally gaining traction after a long protracted battle, we’re likely to see more illegal food businesses step out of the shadows with the blessing of permits and approval from the city. But chances are we’ll still continue to see underground operations continue to proliferate, especially with the help of social media. There’s an appeal to remain hidden -- or at least hard to find -- not only on the part of those doing the cooking, but also for their fans and followers who love the thrill of the secrecy. Danny Jensen is a regular Thrillist contributor who is probably eating in someone's backyard right now. Let him know what's cooking on Twitter and Instagram.